What Is the Significance of a Coat of Arms? A coat of arms is a unique symbol representing an individual, family, dynasty, state, or organization. 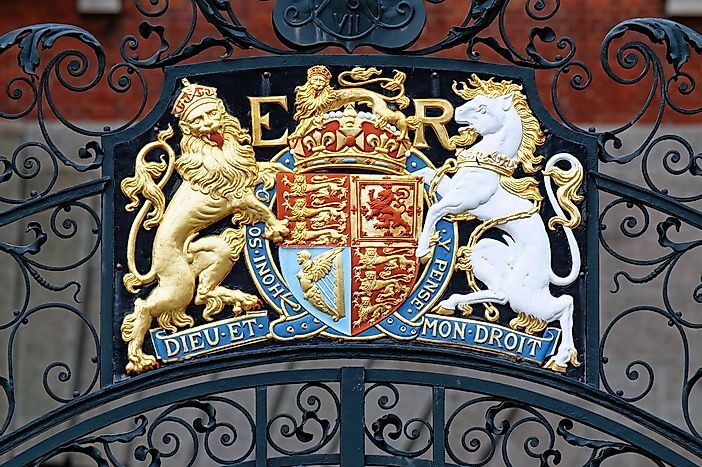 The Royal Coat of Arms of the United Kingdom on Westminster Gate, London, UK. A coat of arms is a special symbol used to represent a specific individual, family, or other entity. The presentation of these symbols differs around the world. Traditionally, however, a coats of arms consists of a number of individual images, including a motto, crest, shield, helmet, and two attendant figures. The motto is typically located on a banner at the bottom of the coat of arms. The crest is an image most commonly used as decoration on top of the helmet of a knight. On a coat of arms, it is located on top of the helmet, which is on top of the shield at the center of the symbol. The attendant figures, also known as supporters, are typically located on either side of the central shield and appear to be holding up the entire coat of arms. Other traditional components on coats of arms include a wreath, mantling, and coronets. Some of the most common images featured on coats of arms include lions, eagles, and horses. Common colors include: red, blue, gold, and black. The creation and use of coats of arms are dictated by a system known as heraldry, which researchers believe dates back to the Middle Ages, during the 11th century. However, earlier examples of the use of coats of arms have been recorded, namely in ancient Greek and Roman societies. In these societies, coats of arms were often displayed on military shields. The popularity of heraldry spread throughout Europe, and became a useful tool for identifying different kingdoms and their members during a time when many people were unable to read. Additionally, these symbols were used by knights during times of war in order to help each side of the conflict identify allies and enemies. Over time, these symbols were more widely utilized by other members of nobility, resulting in more detailed design creations. Some of the positions or ranks that were later denoted by a coat of arms include: dukes, barons, viscounts, and earls. Depending on the specific country of use, some civilians were also given the right to use coats of arms to represent their families, although the right to use certain specific symbols has often been reserved by members of nobility. Since coats of arms are associated with certain families, these symbols have often served as useful tools for reference in genealogical research. The use of coats of arms is often associated with European countries, although Asian, African, and North American countries have also taken part in this practice. In England, the use of coats of arms is regulated by the College of Arms. This process may involve assigning a new coat of arms to a particular person or family. Most of the time, however, the college tries to determine if applicants for coats of arms are actually descendants of a family that has already been assigned a coat of arms. When a person applies for the right to use a pre-existing coat of arms, the family lineage is traced through the males. A specific emblem, known as a cadence, is added to the original coat of arms once reassigned in order to distinguish the degree of relation the new individual has to the original coat of arms holder. In Germany, the use of coats of arms is not limited to people of the noble class and ancestry. Instead, individuals from the middle economic class share the same right to a coat of arms as families from higher classes or statuses. In this regard, German heraldry (also known as German-Nordic heraldry) is considered to be in staunch contrast to the heraldry used in England (also known as Gallo-British heraldry). The image in the middle of the shield of German coats of arms is commonly a lion or eagle. The presentation of this image is different from other countries, however, in that it often takes on a specific pattern rather than a solid color. Egypt is one of many non-European countries around the world to have adopted the use of coats of arms. However, coats of arms in Egypt are primarily used to represent different ministries and departments within the government. Families and individuals do not use coats of arms to represent their status within the country. One of the most common symbols used on the coats of arms of Egypt is the star and crescent, which is often used to symbolize the Islamic religion. Vatican City, also known as the Vatican City State, utilizes coats of arms to represent various positions within the Catholic Church, including: clergy members, diocese, bishops, and the Pope. The use of heraldry in the Catholic Church originated as a means of identifying specific documents. Over time, however, the practice was extended to include personal coats of arms for individuals. In some cases, the individuals in these positions have a family coat of arms. Once a member of the clergy, these coats of arms are often combined with the coat of arms meant to represent their particular office. Heraldry has been used in Japan long before its use in Europe and Africa. Accordingly, its symbolism and presentation are relatively unique in comparison. The Japanese version of a coat of arms is referred to as a kamon and its design tends to rely more on abstract imagery than European coats of arms. Additionally, kamon are noted for the incorporation of flower symbolism in the final design. The use of heraldry in Canada is governed by the Canadian Heraldic Authority, which is overseen by the country's Governor General. This organization regulates the use of coats of arms across a wide range of individuals and entities, including: government departments, corporations, military, and private individuals. The Canadian Heraldic Authority was founded in 1988, and after its establishment the Canadian government, its citizens, and organizations were no longer required to request permission through England's College of Arms.